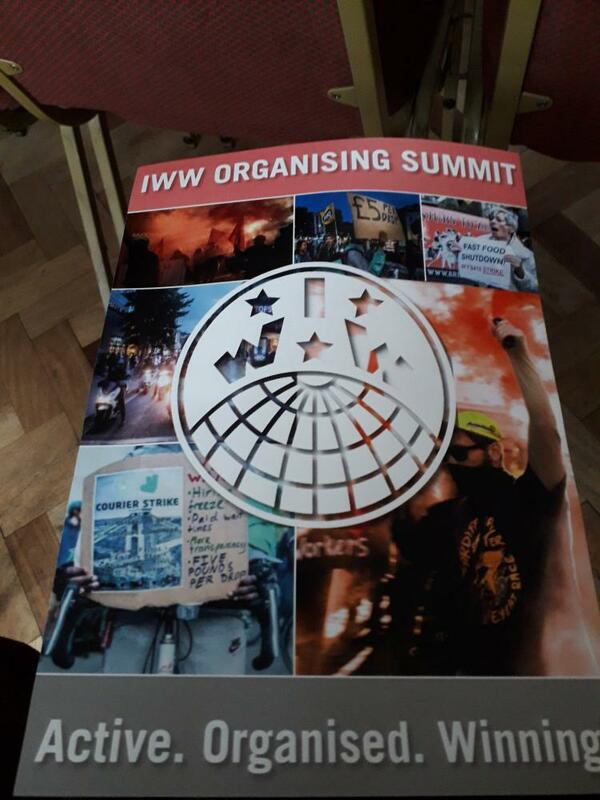 Yesterday the UK IWW held its annual organisers conference, luckily for me this one was hosted by the Sheffield branch and was very easy for me to get to. I had a full day of meeting Fellow Workers from around the UK and in discussion groups sharing ideas about workplace organising and feedback on previous attempts both successful and unsuccessful. Here's a report based on my notes, attendance was 60+ some late arrivals, a good geographic mix, the Welsh branches had a good attendance and some from Scotland , the south of England and not just London, the furthest away came from Northern Ireland. And some American accents but they were part of local branches so not that far. Majority male, we did have a some women, a higher proportion than any other meeting I've been to, but still the difference was notably. Mostly white English first language speakers, but some from ethnic and migrant backgrounds, and all the Welsh members present were bilingual. In terms of representing every worker the IWW in the UK is doing better than the other organisations and Unions I'm familiar with but it does indicate that there are still problems with outreach in sections of the workforce. The day was broken up into two sessions with several discussion groups and workshops to choose from after an opening talk from a guest speaker the head of the Sheffield Trades Council about economic conditions in the city the role a Trades Council can play and some updates on the "Sheffield Needs a Payrise" campaign, a campaign started by the Sheffield Trades Council after the TUC coined the phrase "Britain Needs a Payrise" and then did nothing to push it. The talk painted a rather bleak picture of the main TUC Unions and it was refreshing to hear someone from the TUC willing to acknowledge and call out the behaiours and policies of the TUC that contributed to it, rather than just blaming the Tories and some abstract de-industrialisation process. Like for example USDAW and its agreements with big retail companies like Tesco, its an open secret that USDAW makes deals with big companies to be the one and only recognised Union in their workforces in exchange for no strike agreements and a commitment to bilateral cooperation, but you really hear that being stated from someone high up in the TUC because they have a lot of money to throw around and are pretty close to a lot of Labour MPs. But the aim of his talk seemed to be to encourage the IWW to forge links with their areas Trades Councils and support them in their unionisation drives, which to me seems like the worst strategy to adopt, judging by my own experience with my local Trades Council. Its so dominated by the local labour party, and mostly by the right wing bureaucratic Labour members with the more open and community activists members sidelined. When the RMT disaffiliated the Trades Council tried to kick out the local RMT branch. And from some of the critical questions hostility from the Trades Councils is not a unique experience. I'm glad the Sheffield Trades Council is trying to build bridges outside of the affiliated Unions and wanting to encourage organising campaigns amongst sectors that were written off in the past for being to hard to organise, and I even think some of the actions they have been doing are useful and can be used by the IWW and anyone else also trying to organise and network in say retail, logistics and agency workers. 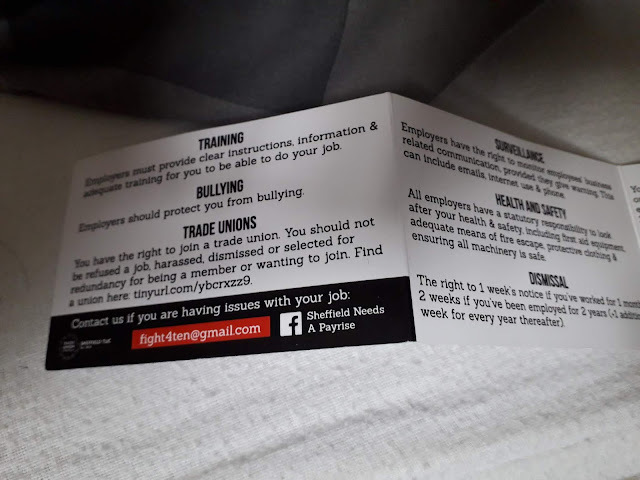 For example they've made a little fold out booklet listing 15 key workplace rights that an employer is not supposed to cross but a lot of employers will happily do so if their workforce doesn't know it. By handing short bits of info like these they hope to do several things, increase knowledge of basic workplace policies and establish contacts to begin conversations so they can find out about conditions at work and how the staff feel and what they need. Some of the facts and figures I managed to note down. is my commentary. The Bakers Union has been putting a lot of its resources into new campaigns and building links in unorganised workplaces, and has received some financial support from larger much wealthier unions. Sheffield has the largest percentage of workers on or just above the legal minimum wage in the the UK. Like many other parts of the UK the city has seen a massive increase in youth unemployment since 2008. Sheffield Hallam University has over 700 lecturers on zero hours contracts, their excuse that these are guest lecturers only was disproven in all but six cases, the rest work their all year round. 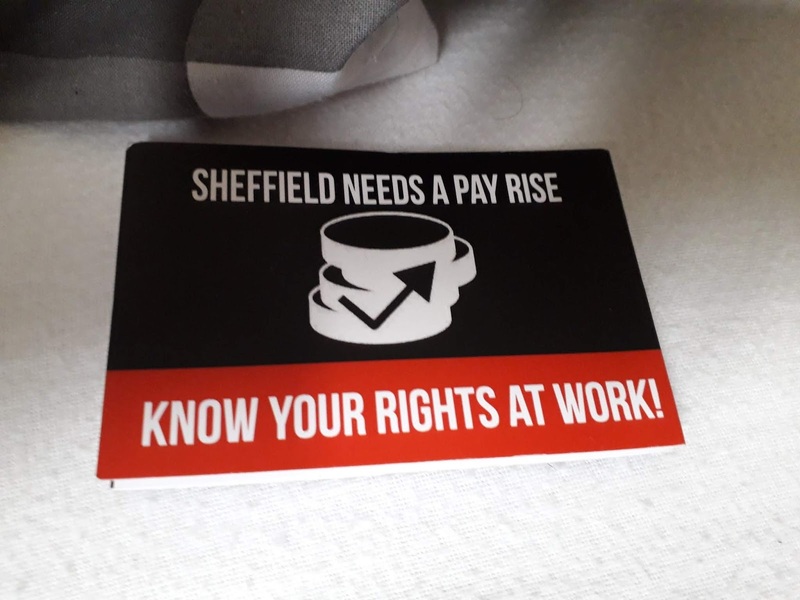 The University of Sheffield brags that its a living wage employer, however before it rolled out the living wage agreement it outsourced a lot of its services including food and catering, so all bar staff, kitchen staff etc, are paid below that rate. With the exception of the UNITE Community the TUC is still largely ignoring the unemployed and those whom get by on very short term contracts. Despite continued higher than average union membership amongst women and ethnic minority workers there is still a lack of representation at higher levels and still lethargy about targeting and supporting workplaces with large or predominantly minority workforce. Here he talked about what the Sheffield Trades Council was doing to increase participation and communication with minority workers in Sheffield, like providing child care at meetings so delegates with kids can come, and changes times and venues for meetings so shift workers can attend. So far they've experienced some increase in attendance and participation but its still been slow going. And in general knowledge of what a Union even is has become very rare, especially amongst young workers. Overall I'd say the room was open to his information and practical advice but not interested in his overall strategy, and I'd concur with that, I wish him well in his efforts but can't shake the feeling he's barking up the wrong tree, even he admitted that he's plans will require a fight on two fronts, not only organising in workplaces but also fighting to put pressure on the TUC and its Unions officers and officials to continue putting resources into (from their point of view) high risk work sectors and build links outside their narrower focus. And he'd also told us that he felt this dual battle had been going on for over 120 years, when the TUC decided to strip its Trades Councils of their power to effect overall TUC national policy which lead to a split with the Scottish Unions forming a rival Scottish TUC, and that in the 1990s the TUC actively tried to shut down most of its Trades Councils to centralise the Unions and make them all run entirely through their national offices down in London. After the talk and discussion we had food and then had a choice of several topics to attend, I chose to go to the Tactics: Changes in Strike Laws and Workplace Organising Workshop by members of the Bradford branch, so that's what I'm going to talk about. The other options were Dual Carding (Sheffield IWW) Organising in the gig economy by an organiser in the Couriers Network and the new Comms officer, Language, Leadership and Whole Worker Organising, lessons from Jane McAlevey hosted by the North West Organiser and Organising in the Care Industry, run by the North East Organiser. I also wanted to go to the Dual Carder talk since I'm a Dual Carder and the Language and Leadership talk but I think I made the right choice for me. The law part was about two minutes, short version, in 2015 changes to the law make it harder for a Union to call a legally recognised strike. So we spent the rest of the time talking about how to resist the boss and force improvements in the workplace that don't require going through the legal process. It was very interesting I got to talk to several other members who shared their histories on the job and I learnt a lot about some work places I'd honestly never considered much before. One of the members is an Archaeologist, which made him a pain to fit in with the other groups who were formed along job lines and economy sector. He joined me and a couple of engineers, it turns out that archaeology is not exclusively the preserve of Universities and Channel 4, a lot of the excavation work is done by private companies often with strict schedules to meet and whom send their archaeologist workers all over the country in digs much like a lot of engineers really. Indeed the descriptions of his workplace sound a lot like how fruit pickers are treated, they get bused into the middle of nowhere and are dependant on the employers to take them back home, meaning they work until the employers say they can stop, this has meant compulsory overtime every work day. So we talked about ways he might go about getting over co-workers on-board, a lot of them are already angry about their treatment so while its daunting it may be easier to start. And one of the members from the Dorset Branch told us that their branch has been sharing the Old Wobbly pamphlet How to Fire Your Boss, and that they've incorporated parts of that into their own efforts. The workshop also provided one way to get over the talking vs doing divide. There's a criticism of meetings and discussion culture that time spent in a hall talking over sandwiches is time that could have been spent on practical activism. 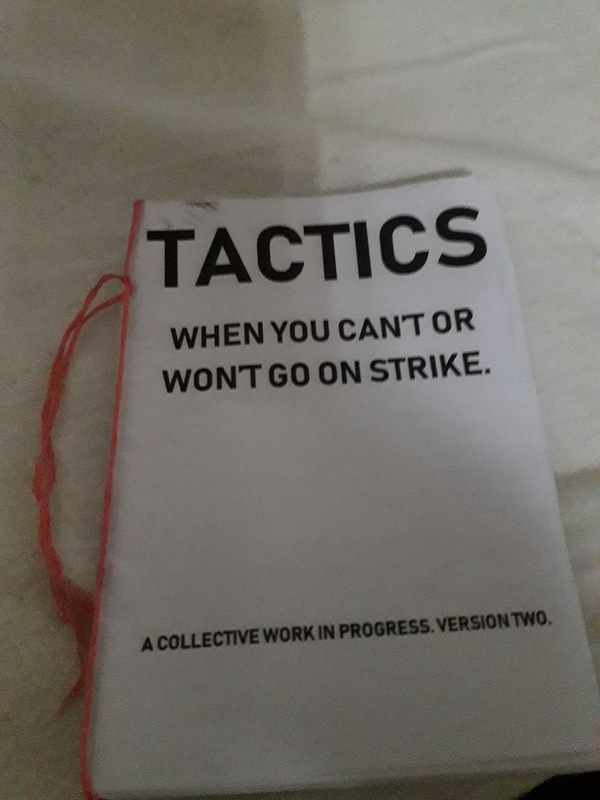 This workshop however does both, our ideas are taken on board by the organiser whom uses them to put out a pamphlet on workplace tactics so they can be used by other workers whom may find that their particular experiences are not solvable in the formal union way. And our comments and experiences are going to be used in version three. Exploiting Prison Labour in the UK & US run by a member of the Incarcerated Workers Organising Committee, and the New Syndicalist was running a drop in session for members currently part of a workplace campaign to drop in for a short interview for a video they're making. I really wanted to attend the prisoner talk-incidentally a friend of mine jokingly pointed out that the way that talk is worded makes it sound like we're interested in exploiting prison labour, which yeah it kinda does- and the talk on targeting an industry looked interesting but I chose to go for the every member and organiser, and again I think that was the right choice for me, I don't believe there's much I can currently do for the IWOC campaigns or targeting an industry since I'm stuck in the one industry in my area, so while I'm sure they'd have been very interesting and enlightening in terms of using what I learned in a practical capacity, they wouldn't be much help. But then again since I didn't take part in them I could be completly wrong, and I hope other attendees who took part in the other discussions also write something up and share their notes elsewhere so we can all get at least a partial view of these important areas. Anyway, the talk was largely state of the UK IWW in the past, its present and potential future, along with some discussion about the age old problems of getting members active. It answered some questions I've had for awhile and while the picture painted wasn't uniformly positive there were some interesting details and very promising improvements. There was also supposed to be a debate on a proposal to use paid organisers, however the member whom was supposed to support the proposal didn't attend, so essentially we got a lot of reason why that would be a bad idea. My notes for this section, again  is my comments not what was discussed. Average attendance of national organising summits is around 60-70, but not always the same 60-70, new faces arrive whom either couldn't attend previous summits [like me] or entirely new members wanting to dive in. A member in front of me was one of these, having joined about a few months ago. 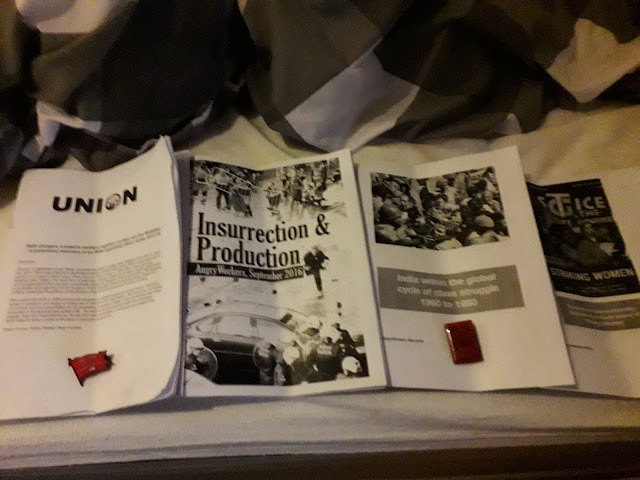 There were some comments on Syndicalism overall in the UK, mainly focussing on the IWW, IWGB and the UVW Unions, their separate strengths and weaknesses what the IWW can teach others, what it can learn from others what we can but probably shouldn't learn from others etc. In regards to paid organisers I was surprised to learn that the IWGB is almost entirely led by professional staff and usually goes through the legal mechanisms to resolve disputes. [Though this would explain why they've been so good at promoting themselves and their actions, I've seen references to IWGB campaigns usually successful in the more mainstream press, but often only hear about similar or even bigger campaigns by the IWW through its social media channels and branch websites though that has started to change. The UVW has also done some very interesting and concerning it recently abolished its elected positions and replaced them with paid staffers, whom in many cases are the formerly elected officers, so there are some very pressing questions about how the UVW plans on handling accountability moving forward. Making Organising a standard part of the agenda and always a topic of discussion at meetings. There are branches that have been active for awhile but haven't gotten involved in any workplace or community actions, one way the Welsh branch [there used to be only one, now there's several like Cardiff and Swansea] dealt with this issue was to make the first item on the agenda and even when there was no organising being done, they discussed why that was and what could be done about. Currently the Welsh parts of the Union are some of the most active in terms of workplace organising and have seen quite a bit of growth. Don't rule out Paper Members, this was a section dedicated to the membership who pay dues but don't seem to get involved. After that we had some general remarks and a discussion, basically the communications and organisation and training departments had been in an extremely poor state, but after this years elections, those departments have been reactivated and are looking at ways to improve, and we've already seen some progress. Regional Organisers, there are now a lot more of them, when I first joined there was London, the South and the North, and one or two in Scotland... not good, now there are more, indeed several of them were part of the summit. Its still not perfect though South West England for example is still vacant with the branches having to do that work between them. So if your a member in the South West of England, like travelling and chasing people up and want to help the work along, maybe drop the organising department a line? And that's about it, there was a closing plenary and a social/fundraiser for the New Syndicalist, but sadly I had to leave early to catch my train so I don't have any gossip on them. Though I did pick up some things. Based on the experiences in London I want to raise some general points for discussion. Towards the end of the organising campaign we got to know some motivated local workers through the solidarity network, some of them of the same language background as the Adelie workers. It would have been great if these workers had been part of the campaign from the start. They could tell people that we are genuine and that we actually helped them effectively. You can find some of the recent SolNet efforts in the pamphlet. The brief visit of cleaning workers who had been on strike at the Adelie meeting was important. Unfortunately we were not able to use their experience in order to demonstrate in detail how the initial fear and perhaps mistrust can be overcome. We should encourage these forms of direct exchange and prepare them better. At certain critical moments a salting fellow worker might have been able to focus some of the brewing discontent at Adelie and could have helped to build bridges between ‘language groups’. Salting experiences are not widely shared, either because the mainstream unions want to keep their strategies for themselves or fellow workers (some of whom we met during our visit in the US) don’t give enough importance to their own experiences. During the campaign at most of the companies where we assumed that there was no union (because workers themselves had little awareness of their existence), management pointed out that they already dealt with a union (Greencore, Kolak, Adelie, London Linen, now Wealmoor). If we don’t want to go only for the crumbs that the mainstream unions leave us, we will have to face the fact that in most bigger workplaces mainstream unions will have the recognised power. We ourselves work in major workplaces with recognised unions and have become shop stewards. We try to push for as much workers’ direct decision-making as possible - currently the main problem is not the union hierarchy, but the disillusionment of workers. Our line is: “It is us who should tell the union what to do - if the union doesn’t agree and do what we want, we have to do it ourselves”. This might seem disingenuous, given that we are pretty sure that workers’ independence will be compromised at some point down the line. At the same time the mainstream union seems to be the only channel to reach a lot of colleagues directly. We see the IWW not as a competing organisation to the mainstream unions, but as a tool that workers can use in order to organise their struggle on the formal plane once they have to discard the mainstream unions. Most of the left groups were celebrating the ‘fast food workers’-revolt and made no difference between the wildcat action of the UberEats workers, the self-organised IWW support and the McDonalds ‘strike’ organised by the Bakers’ Union. The currently most celebrated examples of ‘precarious workers’ organising’ - McDonalds and Picture House/Rizzy - are cases where the interest of the union organisation relegates the interests of workers to the second row. The Bakers’ Union called the McDonald’s strike against the will of workers and their own organisers on the ground. It was a media stunt to guarantee future finances. The union tried to compensate for the lack of actual impact by impressing the public with their support from the Labour Party. The last Labour party conference demonstrated how far the mainstream unions will go to compromise their own ‘democratic rules’ for their goal to stay close to state power. How can we denounce this ‘politicking’ on the backs of workers without appearing to be just yet another competing union organisation. Point 5 above is really interesting and would be worth an article in its own right, IMO. Very interesting from all parties posting above, thanks. Most of the left groups were celebrating the ‘fast food workers’-revolt and made no difference between the wildcat action of the UberEats workers, the self-organised IWW support and the McDonalds ‘strike’ organised by the Bakers’ Union. The currently most celebrated examples of ‘precarious workers’ organising’ - McDonalds and Picture House/Rizzy - are cases where the interest of the union organisation relegates the interests of workers to the second row. Also nearly all the left/alternative media is extremely Corbyn focused, so they're more than happy to get vox pops from union full-timers and will lead on John McDonnell sending words of support or whatever. Then beyond that, a lot of people who aren't involved or following too closely won't pick up on these differences, so will repeat this smushing together of completely different things. On McDonalds, the speaker at the opening plenary from the Sheffield Trades Council did talk about it, but he described it as the first strike Maccies history and the result of the Bakers Union campaign. I knew about the McStrike and the Dublin strike in 79 but figured he meant in the UK. The comments on the Bakers Union also struck me as odd because thanks to sites like this I had thought it was largely started by workers themselves in a couple of restaurants and then it snowballed with groups like the IWW and the Bakers Union stepping in in some way. But I don't really know much about London or the south so I didn't query it. I am pleased to hear that my impressions of the strike are correct. Certainly the videos of the picket didn't seem like something a TUC Union would endorse what with the smoke bombs. About the BFAWU, as I understand it's very much on the far left of the TUC, and probably seems more radical than it is just because it's actually trying to organise new sectors when few of the others are. As the various different campaigns go, it's notable that McDonald's were able to fire one of the key organisers and the union doesn't seem to have been able to do anything to protect them; in contrast, Ivy House sounds much more self-organised, but obviously smaller-scale, and the publicity for the spoons strike makes it sound like there was at least some real shopfloor organising happening at those two pubs in Brighton. Also, less high-profile but the Pennine Foods dispute a few years back sounded like it featured some real mass picketing. I don't know much about the situation at either TGI Friday's with Unite or the Picturehouse dispute, I kind of thought the latter at least was pretty rank-and-file-led but I could be wrong, am open to hearing more. "BFAWU-organised McDonalds workers in the UK had been on strike twice before October 4th. Their much -publicised fast food campaign has already forced concessions from McDonalds. But this was due to be a bigger McStrike than ever before. Not only would a fourth McDonalds site come out for the first time, but two Brighton branches of Wetherspoons would also be joining the fight for £10 an hour and union recognition. As soon as the ballot was announced, spoons workers too won some significant concessions from the employer, multimillionare ‘shitlord’ Tim Marin. TGI Friday workers organised with Unite announced they would also be striking on October 4th - which for some sites would be their seventh day of action. A few days before the strike the government announced new legislation which would deal with the problem of unfair tip distribution which lay behind the TGIs campaign. The model of these campaigns draws heavily on the experience of the U.S. Fight for $15 campaign, led by the SEIU. In this model, unions aim their attention at the fast food industry and set up well-resourced, highly centralised teams of full timers. These teams then go out and organise for strikes in as many companies at as many sites as possible, coordinating these efforts and combining them with a massive media offensive. They often strike without workplace majorities and rely on social movement tactics and a very strong press campaign to cause reputational damage. Political alliances are also key to the model. In the UK in particular, there seems to be an underlying attempt to prepare the ground for a future Labour government to raise the minimum wage to £10 an hour. Alongside this, specific workplaces had additional actions at points throughout the day. The strongest action taken by the Wetherspoons strikers was an evening mass rally in Brighton city centre - which at 300 attendees was about the same size as the London one. The rally was followed by strong pickets that suceeded in producing some workplace leverage. Whilst to the best of my knowledge every other McDonald’s and TGI’s on strike operated at full capacity all day, the two Brighton ‘Spoons experienced disruption as a result of the picketing and closed early. This Fight for $15 model has an underlying weakness. Partly as a result of the necessary control required to maximise media coverage and political alliances, these strikes have been heavily centralised. The main decision makers, in terms of strategy, are the media team and full-time organisers. The strike action is directed from above. This means that the rank-and-file of the union take part in strike action like they’re playing a role in someone else’s’ media stunt, rather than leading their own struggle. They are told what chants they will be using, what T-shirts they will be wearing, what the design on those T-shirts will be, what their picketing strategy will be, which political alliances are being made on their behalf, and where they will stand on the pavement to get the best photos. But the network model does provide an interesting point of contrast to the McStrike/Fight for $15 approach. Courier network branches manage to secure workplace majorities and shut down production in their cities. They have developed huge workplace leverage despite being decentralised, highly precarious and spread across a wide area. 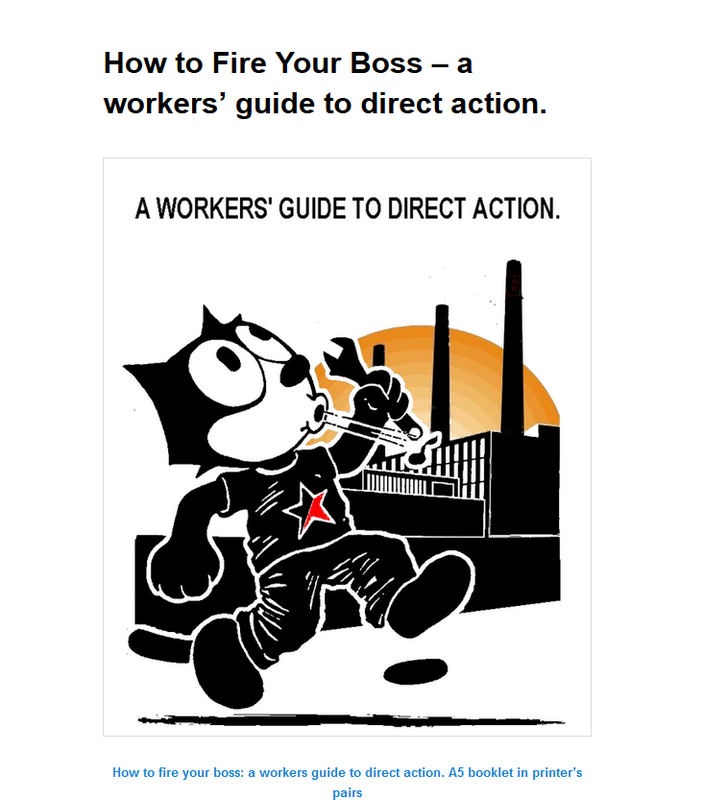 Direct tactics like wildcat strikes and secondary picketing, long since rendered unlawful/illegal for official employees and trade unions, are their mainstay. Following local federated local decisions, the eight-month old national network made the decision to set a strike date for October 4th. With just two weeks notice, they were able to mobilise over a thousand workers across the UK. In fact, food platform workers made up the vast majority of strikers during the entire fast food shutdown. In sum, it is a model where workplace leverage is key and the strategic lead comes from below." Having read this Guardian article from September about the shutdown, has there been any movement on the matter? Are Uber Eats workers on the new rate of £3:50, still on the old rate £4:25 or have they won their demands for £5?